The Antiques Roadshow teams up with an iconic modernist building, the De La Warr Pavilion at Bexhill-on-Sea. Browse content similar to De La Warr Pavilion. Check below for episodes and series from the same categories and more! about the years between now and then. We've turned the speedometer back to 1977, the year the show actually began. and fashion was extremely groovy. It was a time when women walked tall in stacked wedges. Cutting edge flares were a menace to small children and dogs. Shirt collars were capable of lift off. And the velvet jacket wasn't just worn in private, it was in vogue. and the flash motor in mint condition. my TR6 was worth just over £1,300. making a smart investment for the future of my son. get an eyeful of the De La Warr Pavilion, Bexhill-on-Sea. just too modern for its own good. 70 years on, it's a design icon. Which leads us to ask, what objects from our recent past should we cherish for the future? Eric Knowles is already in the groove. Looking at a gramophone such as this, this is the ultimate desire. This and an MGB GT was all I ever wanted back in the 1960s. obviously was, was first introduced in 1956. Good. It is without question a piece of classic design. I mean, people use this term "icons of design"
was the fact that it had got this Perspex cover. I mean, this is Space Age in every shape and form. But I want to know how long you've been playing with it. Well, I bought it in '65 from a shop in London called Imhoff's. It was opposite then the new Centre Point. we thought it was such a marvellous design and it was something you wanted to cuddle almost. It seems silly, but it's so lovely, and then, we've had it since then. -It's been in the loft for 30 years now. and stereo, I'd take all my hi-fi out and put this back because I like it so much. -quick look inside. It's Spartan, isn't it? Um, there's no waste of space here. First of all, let's extol the virtues of the maker Braun. I mean, Braun lead the way here and everybody else followed. you've got 16 revolutions, 33 and 45. Well, 45 ruled the '60s. It ruled the '70s. 16, what do you use 16 for? -Mainly speech LPs and plays and things like that. Very few produced, but it was there. OK, now, the big question is, what did you pay for it? I think it was 79 Guineas with the speaker. A lot of money in 1965. We couldn't afford the stereo version. No, that was a month's wages and more. its value is nearer £300. I've got to say that around about 10 years ago, they were making around about £400, £500. -And I think value does depend on the actual model itself. So if we were saying £300 today, what are we going to say in 30 years? but I dare say that you'd be looking probably nearer £1,000 in 30 years. I'll tell you what, let's make an arrangement now. in 30 years, and we'll see how wrong, or how right, I might be. I'd love to do that. I don't think we will, but I'd love to. but also, what's even better, of course you've got the real thing. Now, who is the Biba nut? Sorry, this is a colloquial term, we're amongst friends. -So you were the older sister? -Tell me your reminiscences actually of the shop itself, describe it to me. and it's all very much in tune with that. ..with Moroccan and Turkish artefacts and so on, and of course, make-up. -This is what...a cake tin? that sort of 1930s style that I loved, um, and just the colours. -and the red, are just perfect. -And terribly brave at that stage. the colour schemes that were used, but actually in the '60s, this was really cutting edge, really new. -you know, era that you know, very much in the past. -And had been swept away really. dark browns, greys, and I think she described it as "aunty colours,"
the sort of things perhaps your maiden aunt would be wearing. -and this was the closest they did to the wilder patterns. -That's why I went for it really. I didn't know the receipt was still on it until I fetched that out. -I don't believe you for a moment! Well, it's 26th June 1974. -It was a pilgrimage, wasn't it? -and I just kept them because they were too lovely to throw away. -..to something perhaps a little bit more for, for the coat that you've got on. But how much was the biscuit tin originally? Well, there we go, originally 40p. Er, today, I would have thought...£15. you will find plenty of venues out there which will enable you to feed your habit. so I'm very glad you brought your heater. Perhaps we can turn it on. -It works, even better. But why have you brought your heater? Because it was a wedding present to us when we were married in 1961. -Having met up there in the ballroom on the dance floor. -So you met in this building? -Across a crowded room, our eyes met. -And it's been wonderful ever since. -when you get married in, what was it, 1961? Well, we actually had no furniture at all really apart from bits like this, so I think we were modernists. -I was, I'm not sure that Richard was. -We had to be minimalists, we couldn't afford anything else. -So, minimalism is to do with having no money. spiky legs and all that sort of thing. you still use it, and it links so precisely to the building. -this is a record of coming together here. -It does go very well with the building, doesn't it? -When you see it here. If you can, cast your mind back to 1977. If you can't, ask your dad. Virginia Wade won Wimbledon, and Star Wars was on its way to becoming one of the top films of all time. But apart from the birth of the Antiques Roadshow, what was telly up to in 1977? And time to come alive with some hit music and jive on this week's Top of the Pops! Did you know you can do multiplication sums on your fingers? -This may look like an ordinary piece of corrugated iron. Here is the news from the BBC. I loved him, loved his music. # Are you lonesome tonight? -he really and truly will. Hello and welcome to "Ask Aspel". OK, girls, let's get to the, to the bottom of this. -well, it's sort of Starsky & Hutch heaven really, isn't it? That would be the Starsky doll, and notice the cardigan. -I am noticing that cardigan. -It was knitted by my mother in 1975. -And did she knit you that one at the same time? -No, my friend here knitted this one. -And who made the jacket? I made the Hutch jacket, yes, matches the Hutch doll. -So... So, you became, this is not your life. You have more lives. Yes, we do have lives, yes. But you, you share this extraordinary passion for Starsky and Hutch? -So there you were, glued to the TV sets every, what was it, Wednesdays it went out? That was repeats on the Wednesdays. -And they were a complete phenomenon really from day one, weren't they? To put it into context, there weren't any similar hard-hitting detective series at that time. -because it was too violent. -things made for kids, but it wasn't, was it? -Well ahead of its time. -And yet the nub of the show, the friendship between the two men, is what made it so long lasting. And they were good looking. -Not for me it wasn't. -I have to say, he was my favourite. were you both buying at the time? So you were collecting from the start, and were you also? 22 I think, to collect at that time, but I did go and buy the magazines. and every month more pictures, more letters, more stories. -And I can see he touched this page. I mean, there are some things here that one sees relatively regularly. The Corgi toys, something that you see, and some of these games turn up. -I must say, there are some things that are rarer, this for instance I, I don't remember seeing. I guess value is kind of not what it's about. It's priceless to us. Priceless, yes. is going to go up in value, more and more people are going to become fans. just whether your mum was going to give you enough money to buy a Starsky and Hutch magazine. Who can ask more from a collection than to do that? -I don't suppose either of you can remember the theme tune. -The theme tune, let me see. I feel very comfortable sitting here. I feel I could spend a long time chatting around this table. Is this something you use a lot? We have used it a lot in the past, particularly sort of family dinners, things like that. retro furniture, but you said you've had it for quite a long time. So, when did you get it? In the late 1950s, leading up to 1960, when we got married. and, um, the sort of teak and stainless steel look was, was coming in at that time. We decided we wanted it and ordered it at a local store in Maidstone, and they got it for us. -Fantastic. So you were very design conscious when you were, when you were young? And did you know when you bought this set that it was designed in 1959? we were aware that sort of thing was going on. But I think it's worth looking at what really makes it so interesting as a design. -You've got this lovely oval table, and it extends? -So, how many leaves does it have? -It's got a centre leaf, which is stored underneath. metal legs as the table, and this sort of slightly geometrical elliptical shape to the back. -really is looking to Danish or Scandinavian design as well. of German modernism and Scandinavian humanism, if you like, in the shape. So, let's move over here and see what we've got behind it. commissions of the 18th and 19th Century, and the little stool here. -The chairs have been reupholstered at some point? -And this is the original fabric. not the very highest engineering quality, it's quite simple, isn't it? -This was the accessible face of the new design. stylish little pulls here, I like that, the cutlery drawer inside. Can you remember what you paid for it? No, we've been trying to think of that, it's almost impossible to think back to those times. which was a lot then when we weren't earning that much. if you look on internet sites, you can probably find a set of chairs for, I don't know, £100. at auction this is, er, about £850. -how simple the designs are, how elegant the designs are. Oh, well, you convince them that this is, this is the new Chippendale and you'll be away. and 30 years of the Star Wars saga of course, this being the 6th film. You were presumably a fan as a child? Yeah, just really never seen anything like it before really. do you know why this is such an interesting poster? Their name, they changed the name at the last minute from "revenge" to "return". wasn't something that a Jedi should really have. So a little bit un-Jedi like, so they changed it. -The other interesting thing about this poster is that it's probably one of the most faked movie posters. within the poster. That will indicate it's a reproduction. The other side of it is the fact that the "Star Wars"
running along here is quite often in orange and not this yellow. -And there's a little red line at the top. -on some of the reproduction posters. -The one in the corner? In the bottom corner, yes. And sometimes it's a much darker blue. and a yellow here across the "Star Wars". and that they're the normal hallmarks of it being a reproduction or a fake. -I think this is brilliant, I think it's absolutely correct. But it's also very good news from the financial side of it as well, because I don't know what you paid for it. I paid around just short of 100. I can see fetching anything from sort of £250, £300, maybe a little more. Darth Vader of course, you know, featuring large is a good thing. -And I don't know if you've noticed this, have you ever looked at the light sabres? They are the wrong way round, exactly, it's another interesting feature. just never sort of grabbed me, but obviously it's grabbed you. So, when did you start again? "I remember when I was a kid owning one of them watches,"
so I thought, seemed a good thing to collect, so I started to go back as a kid and collecting them. So you were going back to your childhood in a sense? -Where did it start? Have you got it here? the Pulsar P1, that come out in, er, early '72. Everybody saw that and thought, "God, we'd better make those," so Omega do it, everybody else does it. but Pulsar was the first, that was very expensive back in the early '70s to buy. So what would that cost then? -Which is a huge amount of money. -Now, when does it die out? Um, around about '77, Pulsar closed because the LCD market took over. But hang on, let's get this story, LED/LCD. Yeah, Light Emitting Diode, LED, LCD - Liquid Crystal Display. -This is a short period in watch history? -Yes, six years and it was pretty much done with. -And then it's all over. -Then it was all over. -about its time, and that's why they're collectable. They have that wonderful resonance of when they were made. You wear them very much making a style statement. This is a Girard Perregaux Sideview LED watch. -..and GP was a company that made 'em. -What do you pay for them now? -So this was 2,000 when it was new? it's got a gold magnet, it's gone as high as 17,500. -But how many have you got? Does it cause domestic stress? Well, she's got you know, many pairs of shoes, so she can't complain. -But this is a bit more expensive. -us men collectors have to fight back. but I'd certainly be picking the ones by great designers. and the headline is, or the baseline should I say, "The King is Dead,"
and here's a fantastic picture of Elvis. of which we all here are all part of, which was the birth of the Antiques Roadshow. So, how many of these things have you got? We've got them all around us. Well, I started collecting them in 1970 at the very beginning. -So I've got over 1,800 copies. Why did you start? Do you just like hoarding paper? No, I don't think it was a decision that I just said, "I will keep them,"
the period that she was born into, and thereafter. -A sort of cabinet of curiosities. -I think it's absolutely fantastic. -This is particularly grim, they do quite a lot on Cambodia, don't they? -"when they won the Wild West". So, how much do you think you've spent over the years? it might be £1, so we're talking about £1,800. £1,800. Does your wife resent it? who now presents the Antiques Roadshow, and this dates from 1970. 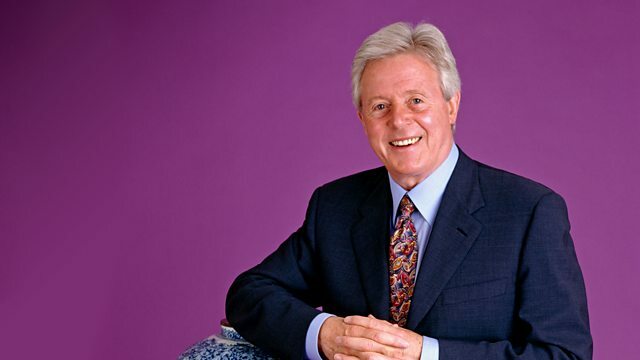 -This is Michael Aspel 37 years ago, not a grey hair in sight. "the world's greatest work of reference." And you get a free disc with it, it's quite incredible. -they're so exciting I could actually sit down and read them all over again. -It's like a dentist's waiting room gone mad, isn't it? -That's where I collected them from! a chronicle of the time we live in. would certainly go for £10 or £15. -I would imagine that Charles and Di would do the same, wouldn't it? -But I think that you've got £5,000 worth I reckon. These two lovely watercolours by Mary Fedden, are you a fan of hers? and I decided in a matter of minutes that I would buy 'em. In each case I bought them about two years, I must be the second owner. -She's a wonderful artist and very much in vogue now because she was born in 1915. -And she's still painting as we're talking now. And lives in London and she was married to Julian Trevelyan, another artist. Yes, I know she was married to Julian Trevelyan and she didn't paint very much during that time. it's very whimsical this one on the right. Yes, it's almost allegorical I think. -Wonderful, and the one on the left here looks a bit Cornish. -Do you know where it was painted? -It was painted, it's called Lostwithiel. and I think she painted a little bit, but not very much. heightened with gouache, and the one on the right here is watercolour with gouache, mixed media really. -and certainly Mary Fedden and Julian Trevelyan, and they're considered very important British artists. She taught at the Royal College of Art. -She did murals for the Festival of Britain in 1951. -And you know, she is considered important today. What did you pay for these? -Er, I think I paid about £1,500 for this one. And I paid about £3,000 for this one. -in the 21st Century, the taste has gone very much for the modern and also onto abstract artists. And she has also gained huge popularity in the last few years. in auction today £5,000 to £7,000. I'm sure you've seen many of her still life paintings. -These are out of the ordinary for her, aren't they? So the one on the right here, I think would make certainly £6,000 to £9,000. -Well, I'm not thinking of selling them. -but you didn't buy them because of that. -No, I bought them because I liked them. stops me in my tracks, this is one of them. in one place at one time and I suspect I'm very unlikely to ever see a collection like this again. Where have they all come from? What started you off? Owning a Praktica 35 years ago. -You see to me, that's a real workhorse, isn't it, that's the basic of basic cameras. -which was a Nikon F.
-the company started as a manufacturer of military lenses and things, didn't it? -which means the Japanese optical industry. to produce anything for military purposes. and they were looking for a market, and the market was cameras, and they went with this product. I think of photo journalism, and we've got the F Series. -it was there when man walked on the moon. -Let's pick out an F series. a very early F, very basic. photographers in the Vietnam War used these kind of cameras and would often say they were bullet proof. -I don't know how many Nikon Fs saved people's lives. -and the camera and the lens has stopped the bullet. -So there is a bit of reality in that. -It's not just an urban myth. with an elastic band around, and picked up later so the photographers would not lose the pictures. about what is just on this table. Is this the whole collection, or...? -No, it's about 5% of what I've got at home. -I'd be being conservative, would I? -You'd get the half of it probably. -That's it then! That's enough for me today. This has got an amazingly ancient look about it. Older than the Dead Sea Scrolls. -Well, they were around...nought, weren't they? -Um, this would be around the Han Dynasty. Um, like the terracotta figures, a very unusual thing, where did you find it? in south east London a few years ago on a Sunday afternoon. -Did they tell you what it was? I'd just finished a part-time archaeology course and my eye was just really intrigued by it. -I knew because it had kind of sandy earth, I presumed it was some type of funeral offering. -Er, yes, indeed these were grave goods. you get this incrustation and you get all this wonderful colour building up here. and that's because of acid attack by the soil. -B-I, which actually has a hole in the middle. And were they buried under the elbows and above the head? -They were all over the place. -it's supposed to be for discerning the future and stuff. this would have been buried with somebody with, of serious..
-Oh, serious, highly important official. but a highly important official would have this. Now, how much did you pay for it? Well, he wanted like £50, and I had no money and I bartered him down to 30 quid. OK, now I'm going to put you out of your misery. Oh, no! You're joking, are you joking? -But hang on, I haven't finished yet. -Oh, God, my life's over. Listen, we are looking to the future. -This class of ware, this class of ware is coming from China. -..because they still can afford the skilled craftsmen to do it. -Is it cast from an original? -No, I don't think so. It's a fantastic bit of work. -This is my prediction for the future. -as so called, predicting that a forgery was something to buy. -It's like a stab to the heart! But if you can find that for 30 quid, go out and buy them. Your children are going to thank you. -Thank you for being so brave. -Oh, I'm so upset about that. Listen, if this was real, it would be worth close on a million pounds. Oh, God! Oh, I love it though, thank you for letting me know about it. It feels like a real party atmosphere today, here we are in the sunshine at the sea front. -What we really need's a bit of rock and roll, thank you for bringing it. -So, Rock-Ola, Chicago Company, 1960s jukebox. Are you a passionate jukebox man? Jukebox and rock and roll, yes. So this is one of what, several jukeboxes you've got? I've got two and I've got a third one on its way. And a whole lot of records, it looks like. -So there are what, 50 in here? is I suppose this fits into a small, more domestic scene rather than a cafe or a club. in the coffee bars in Tunbridge Wells where I used to live. This model was in all the coffee bars. -So, that's why I got it, as nostalgia. -So it takes you right back. OK, so it's a piece of nostalgia, but it's a valuable piece of nostalgia. I would have thought today we're talking about £2,000, £2,500. Well, I think that's what's known as a successful exercise. We have confirmed that modernism is alive and well and has a great future. because we were both dreamed up in the same year. The difference is, the building still looks exciting. Many thanks to everyone who helped us with this special edition, and from Bexhill-on-Sea, goodbye. The Antiques Roadshow teams up with an iconic modernist building, the De La Warr Pavilion at Bexhill-on-Sea. It's the perfect place to identify items from our recent past that we should cherish for the future. The team cast their eye over a feast of colourful modern collectables.